Derren is planning to take a theatre show to New York towards the end of 2012. Whilst, at this stage, we have no further details, we are asking if you would be interested in seeing Derren perform live in New York. If this is the case, then do yourself a favour and sign up to the exclusive mailing list that we have created. This way you will be the first to get further information should the performances go ahead. Here’s a recent Interview with Derren that appeared in The Times a couple of weeks ago which some of you may have missed. Note from Derren: I do NOT iron my jeans. No idea where that came from. 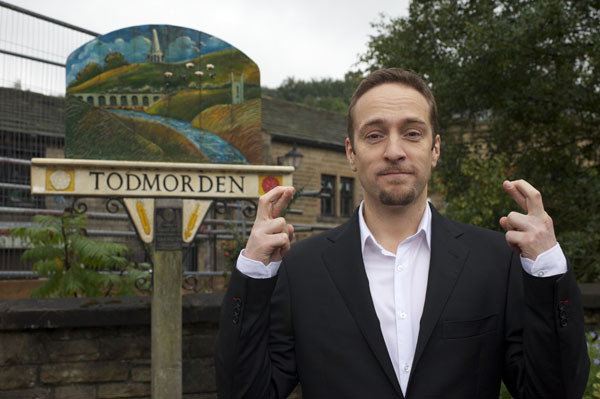 The Illusionist Derren Brown tells Stefanie March how he has always felt a bit different. Is Derren Brown a normal bloke who surrounds himself with eccentric things, or is he a weirdo as well? His former writing partner once described him as “genuinely odd” and, certainly, there are a lot of dead animals in his apartment. The few live ones are a blue parakeet and a handful of multicoloured fish. The dead ones include a pickled baby chimp and a spaniel that lies placidly at the foot of a living room armchair next to an equally dead Yorkshire terrier.